Marianna Uutinen at her studio. For over thirty years, Finnish artist Marianna Uutinen has been making works that reject the making of gestural marks in favor of an expanded notion of painting. 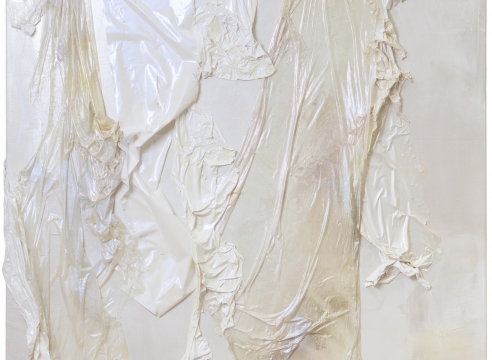 She is best known for her large-scale abstract paintings made using her signature technique, which comprises building up layers of acrylic paint to make a skin and then draping these skins directly onto the canvas. Marianna, you split your time between Helsinki and Berlin. How does that work on a day-to-day basis? I’ve been in Berlin about six or seven years now, and from thebeginning I wanted to keep studios in both places. This is an urban space and in Finland, where I still have a lake house, it’s more about nature. I need both, so this is the perfect arrangement for me. So, both places have an important role to play for you. I go back to Helsinki every month to livemore my home life there. Whereas Berlin is a great working place and represents a place of freedom for me. Here I can put my work in another context and also free myself from materialistic living in a more ascetic way. For example, my flat is super minimalistic. There’s not much furniture around … I prefer light and space.